Successfully Added 8GB Hamburger Flash Memory Drive - Novelty Shaped USB Storage to your Shopping Cart. 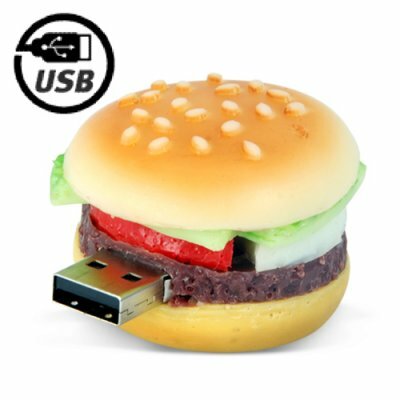 USB flash drive with huge 8GB flash memory in the shape of a tasty hamburger. If you need a high capacity flash drive but do not like the design of other choices, this flash drive provides 8 gb's of memory space for all of your data while doing it in a unique style - welcome to the CVSBO-5902-8GB! Very small, made from high quality ABS plastic, with all the benefits of USB 2.0 speed and use with any computer or other media devices using a USB connection, this little memory gadget simply makes your life a lot easier. Get an item that is sure to stand out from your competition in your own online store or eBay storefront at an incomparable low wholesale price direct from the factory to you. The second generation of the Original 8GB Hamburger Flash Memory Drive - Novelty Shaped USB Storage, as seen here first on Chinavasion! To economize on shipping costs we recommend ordering this item in a quantity of at least 5 pieces. Please visit our award winning news blog for other articles related to bulk purchase savings.